Although each boy has his own house with large run in the garden, each has a daily excursion into the garden, usually in the early morning, when everyone else is inside asleep. Each goes out on his own and is free to race from one end to the other, climb trees, chew grass, and greatest joy, overmark their territory, obliterating the hard work of the one that went out before him. They usually take themselves back home again after about 45 minutes. 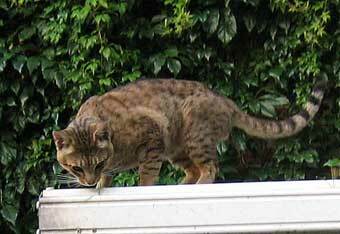 Thunder is a big Tawny, brown spotted, with the real wild look, but he is a softy really. Curry arrived here in December 2006, somewhat traumatized from his journey. He has settled , enjoys the garden, and has had several lovely litters. He is a deep rich cinnamon and has excellent type, with a strong head and square muzzle. His pattern and contrast are beautiful. Many thanks to Anne McCulloch for letting me have handsome Curry. 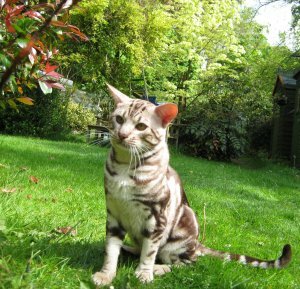 I hope he will be instrumental in establishing the fawns and fawn silvers, so that all ocicat colours will be fully represented in the UK. Here he is enjoying a spot of 2008 May Day sunshine in the garden. Blue Silver. Has found his feet, and we have many beautiful kittens to prove it. 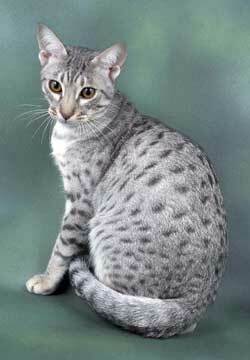 CusCus was overall Best in Show at The Ocicat Club Show 2005. He loves shows, being very relaxed and only wanting lots of attention. 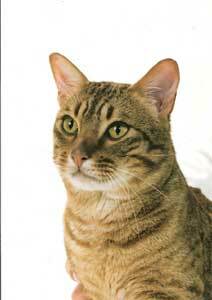 CusCus became a Champion at the Surrey & Sussex Cat Association Show on March 18th, 2006. CusCus was awarded his third Imperial Grand Challenge Certificate at the Ocicat Club Show in October 2008. 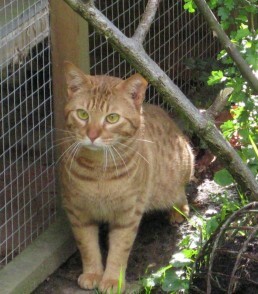 Homer arrived in early February 2009 from Barbara Stewart in the USA. We are so pleased to have this gorgeous boy . He has a beautiful temperament , and already has 2 Merit Certificates to his credit, the second one at the Bristol and District last month where he had a Red Card Day (First in all his Classes). I will always be grateful to Doris Broomfield for letting me have this lovely boy from the USA. He is greatly missed.